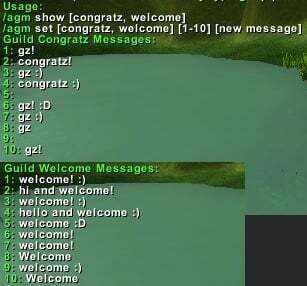 Allows the user to assign up to 10 random welcome messages where 1 of these messages will be selected at random and will be sent to Guild chat to welcome a new member of the guild automatically. Allows the user to assign up to 10 random congratulation messages where 1 of these messages will be selected at random and will be sent to Guild chat when a guild member (other than the user) earns an achievement automatically. Congratulation and welcome messages will be sent after a delayed time of 4 seconds and will only be sent once. If a guild member earns 2 or more achievements in less than 4 seconds then only 1 message will show. The purpose of this AddOn is to make it look like you are not using an AddOn to welcome new players or congratulate guild members automatically. Option to blacklist a player you do not wish to congratulate. Option to pause and play. Option to add a custom message for specific achievements such as the achievement for reaching level 90. Add a Set All function to set all values in a list to the same new value. Alter the delay time to be random between 3-7 seconds. It can be 3.24 seconds for example. "/agm show [congratz, welcome]" - Shows the complete list of 10 messages. Note: Do not include square brackets with the slash commands! Example slash command: /agm set congratz 4 well done! -- Fixed a welcome message bug. -- Only 1 congratulations / welcome message will be sent and after a delay of 4 seconds.